Rooms have been reserved and special conference rates have been negotiated with the following hotels, delegates can choose which accommodation they would like to book on their registration form. Accommodation is available across a range of price categories. 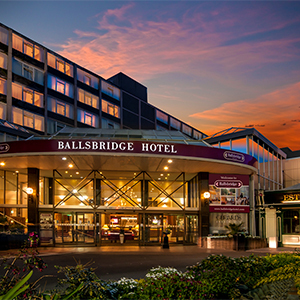 Our Congress Partner Hotel, The Ballsbridge Hotel is located in the embassy district of Ballsbridge within 5 minutes walking distance from the conference venue. This is a beautiful area serviced by many bus routes and the DART rail system. The area has a village feel with many bars, cafes and restaurants on its doorstep yet is only a 15 minute walk from the city centre.